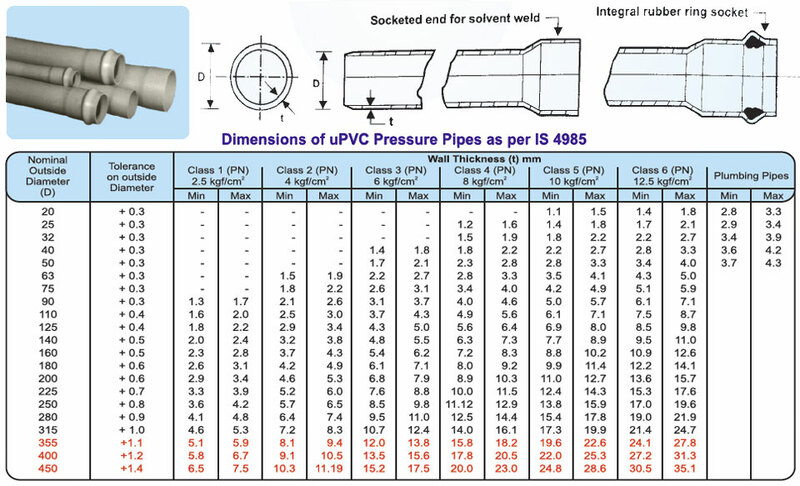 Super offers an exhaustive range of uPVC pressure pipes and fittings. Pressure pipes are manufactured as IS 4985 standard and are available in 20mm to 450mm sizes in different pressure classes. Pipes with both types of joints i.e. solvent cement type and rubber seal type joints are available. Varities of moulded fittings and wide range of handmade fittings are also available. Moulded fittings are manufactured as per IS 7834 and fabricated fittings are manufactured as per IS 10124 as well as company standards. These pipes and fittings are used for variety of applications like agriculture, irrigation, water supply, industrial process lines, swimming pools and fire fighting mains etc. these pipes are superior to C.I., D.I. or R.C.C. pipes and offer number of advantages like light weight, easy and fast installation, excellent corrosion and chemical resistance, high flow rates, long life and economy. Self-extinguishing quality – This eliminates need for fire resistant coatings. High corrosion resistance – Being immune to chemical, electrolytic and galvanic action. These pipes are free from corrosion. Maintenance free – Corrosion resistance property of the PVC pipes eliminates the need for painting or coating. High chemical resistance – Pipes offer excellent resistance to acids, oxidizing agents, alkalis, oils and domestic effluents. Longer lasting – As these pipes are free from weakness caused by scale formation, rusting, weathering and chemical action they last for a life time. Smooth bore – Pipes have mirror smooth inside surface and hence better flow characteristics in comparison to AC, CI and GI pipes. Economical – Apart from superiority over conventional pipes, Super PVC pipes are light in weight and hence they offer total economy in handling, transportation and installation. Sizes mentioned in red color are not yet introduced. 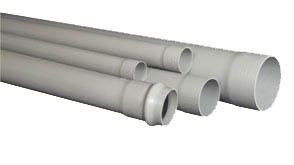 Pipes are offered in Light Grey (LG) and / or Dark Grey (DG) color in standard lengths of 6 meter. Pipes are offered plain or socketed, based on diameter and class of pipe. Ringtight pipes with integral rubber ring socket (Elastomeric joint) are available in 63mm to 315mm in 4, 6 and 10kgf/cm2 pressure class. Prefix “PN” indicates Nominal Pressure i.e. working pressure.